Cartel leader, with $5 million bounty on his head, found shot to death in Venezuela. BOGOTA, COLOMBIA -- Authorities in Venezuela said Friday that Wilber Varela, the leader of Colombia's Norte del Valle drug cartel, had been found shot to death in the Venezuelan resort town of Merida. The location of the killing underscores the evolution of drug trafficking in the region. Increasing amounts of Colombian cocaine destined for U.S. and European markets flow through Venezuela, and as much as one-third of all the narcotic powder is now thought to transit there. Varela, 50, had long been rumored to be living and working in Venezuela under protection of corrupt officials. He was indicted in 2004 on drug trafficking charges by a Washington federal court, a warrant was issued for his arrest, and a $5-million bounty placed on his head by the State Department. At a news conference Friday in Caracas, Venezuela's capital, Nestor Reverol Torres, director of the country's national anti-drugs office, said authorities had used intelligence and fingerprints to conclude that a dead man registered at a Merida resort hotel as Jose Antonio Perez Chacon was Varela. "It's been convincingly determined that we are dealing with the same person," Reverol said. The bullet-riddled bodies of Varela and Weimar Perez Aramburu, thought to have been Varela's bodyguard, were discovered Wednesday in Merida in Venezuela's mountainous northwest. Details of the killings were unclear, apart from a report that the two men were originally accompanied by two other men who escaped. No arrests have yet been reported. The Norte del Valle cartel, named after a farming region north of Cali, is among Colombia's most powerful cocaine trafficking operations. In Varela's 2004 indictment, prosecutors alleged that the Norte del Valle cartel had shipped about 550 tons of cocaine worth $10 billion from Colombia between 1990 and 2004. Last summer, reports surfaced that the cartel also had made inroads into the Colombian military. A Colombian admiral gave coordinates of U.S. Navy and Coast Guard vessels to the cartel so their drug shipments could avoid interdiction, Colombian prosecutors said. In 2006, Colombian army soldiers killed 10 U.S.-trained anti-drugs police near the town of Jamundi, allegedly on the orders of Norte del Valle cartel bosses. 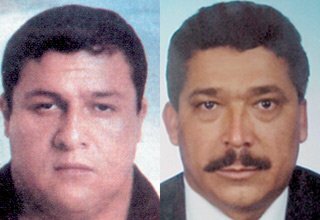 Among the cartel leaders arrested in the recent months are Diego "Don Diego" Montoya and Juan Carlos Ramirez Abadia, "El Chupeta," who was arrested in Sao Paulo, Brazil. Such arrests, as well as killings and a power struggle that U.S. officials estimate has left 1,000 people dead in recent years, decimated the cartel's leadership, leaving Varela on top. Varela "was in recent years the major boss of Colombian drug trafficking organizations," said Gen. Oscar Naranjo, commander of the Colombian National Police. "What has happened should be a blow to criminal organizations . . . . He is the last of the big capos of Norte del Valle cartel." The U.S. has recently stepped up criticism of Venezuela for not doing enough to stem the flow of drugs, or prosecute police, national guard and army officials who are thought to be involved. In an interview with The Times last month, White House drug czar John P. Walters said the Venezuelans' inaction in the face of increased drug flows was "tantamount to collusion." Venezuela vigorously denied the charges and brought a complaint against the U.S. before the Organization of American States. It said its counter-narcotics program was effective. Drugs and other contraband have always passed through the porous 1,400-mile Colombia-Venezuela border. But U.S. officials say the volume of cocaine crossing the border has accelerated sharply since August 2005, when President Hugo Chavez called a halt to all cooperation between United States and Venezuelan anti-drugs officials, alleging that U.S. agents were spies. Chavez told U.S. Ambassador Patrick Duddy last fall that he would like to restart counter-narcotic cooperation. So far, nothing has come of it, U.S. officials say.